The National Air and Space Museum was established in 1946 to care for the Smithsonian’s growing aeronautical collections. 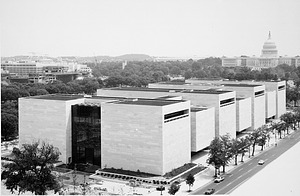 On July 1, 1976, a new building opened on the National Mall to showcase the collection. In December of 2003, the Udvar-Hazy Center opened near Dulles Airport in Virginia to display additional collections. The National Air and Space Museum, Independence Avenue side with U.S. Capitol building in the background. The National Air Museum building in the South Yard seen from the southeast side with a French made Renault tank and a German howitzer sitting by its door. 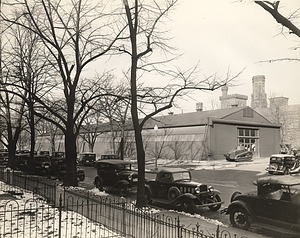 On the street many automobiles from the 1920's are parked and in the foreground is wrought iron fences around yards. The building was also known as the Quonset Hut. The Smithsonian Institution Building is seen in the background. The "Spirit of St. Louis" hangs above the North Hall of the United States National Museum, now known as the Arts and Industries Building. The Northeast Court and Galleries can be seen clearly through the archways in the North Hall. The "Statue of Freedom" can be seen in the Rotunda, and the "History of the United States" exhibit can be seen below the plane. 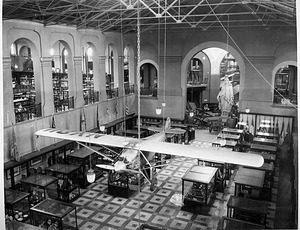 Charles A. Lindbergh donated the airplane to the Smithsonian on April 30, 1928 and The "Spirit of St. Louis" first went on display in the Arts and Industries Building on May 13, 1928. 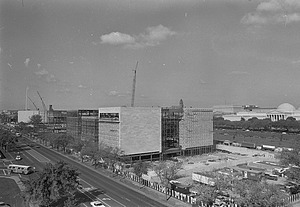 Construction on the National Air and Space Museum on October 16, 1973, viewed from the southeast. The ground breaking ceremony for the new museum building was on November 20, 1972. 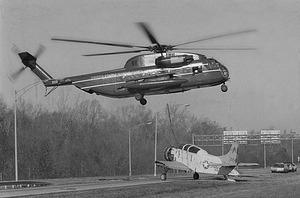 A United States Marine Helicopter moves a Skyraider fighter-bomber from Dahlgren, Virginia Navy Base to the National Air and Space Museum's Silver Hill Storage Facility, November 15, 1974. 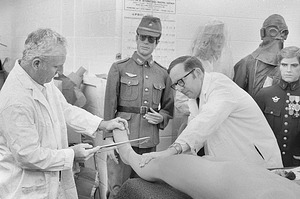 Shortly before its opening in 1976, Richard Marshall (left), National Air and Space Museum Exhibits Specialist, and Charles "Glenn" Sweeting, Assistant Curator of Aeronautics, adjust mannequins to fit into historic uniforms for exhibition in the National Air and Space Museum . Since the uniforms on display in the museum are historically accurate, they cannot be altered to fit the mannequins, so the mannequins are altered to fit the uniforms. 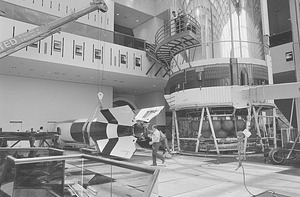 Before the opening on July 1, 1976, United Rigging installed a V2 Rocket in Space Hall in the new National Air and Space Museum building. 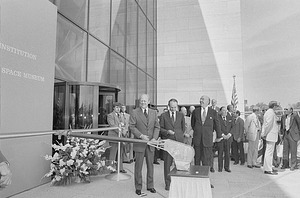 President Gerald Ford, former astronaut and NASM Director Michael Collins, and Secretary S. Dillon Ripley with satellite ribbon-cutting apparatus on July 1, 1976, are ready for the opening day ribbon-cutting ceremony at the National Air and Space Museum (NASM). 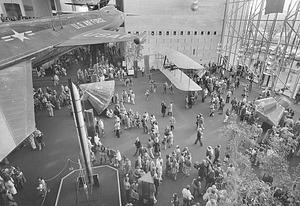 The "Milestones of Flight Gallery" draws a large crowd of visitors in the newly opened National Air and Space Museum. This photograph was taken December 28, 1976. 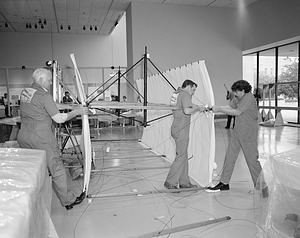 Three men at work at the National Air and Space Museum's Garber Facility on the Wright Flyer during its 1985 restoration. National Air and Space Museum's Space Shuttle "Enterprise" flew into Washington Dulles International Airport on November 16 atop a modified Boeing 747 carrier Aircraft. 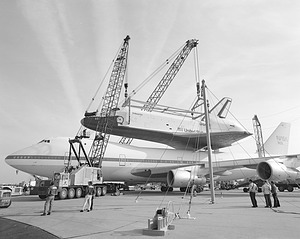 Using cranes, the "Enterprise" was removed from the top of the 747 and lowered to the tarmac at Dulles on November 17. On December 6 the National Aeronautic and Space Administration transferred title of the "Enterprise" to the National Air and Space Museum at a black tie gala at the airport. 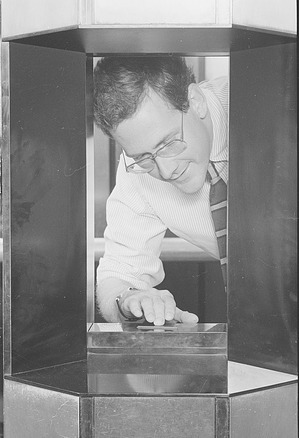 John D. Barrat, from the Office of Public Affairs, is touching the Moon Rock on exhibit in the National Air and Space Museum. 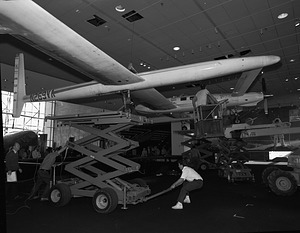 "Voyager," the first aircraft to fly around the world without landing or refueling, is being lifted into place in the south gallery of the National Air and Space Museum (NASM). 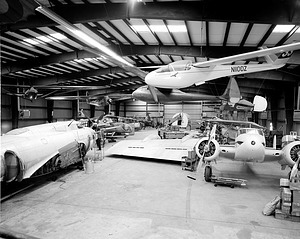 The craft, which has a wingspan of 108 feet, was separated into five sections and transported from the Paul E. Garber Facility in Suitland, Maryland, through the streets of Washington in the dead of night.